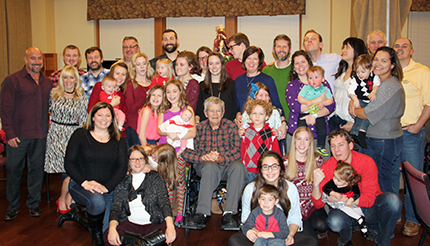 Bayley resident Larry Wanninger and his family enjoy the holidays together in 2016. Many of us think of retirement villages/assisted living/nursing homes as the last chapter in our lives, but for my parents it was a place to call home, where the cares of owning a house faded away and caring became a focus on the individual life. We could not be more blessed to have Bayley as a part of our lives. My aunt was a Sister of Charity and was active at [Mount St. Joseph University]. My sisters Kathy, Anna and I attended the Mount. My great-aunt entered Bayley assisted living when the facility opened and was a resident for 11 years. After visiting her often, my parents really liked the care she had received and the independence she enjoyed. My parents raised all 10 of us children with conservative values and taught us by example, to treat each other with respect. There are many grandchildren and great-grandchildren in the family and as you can imagine, we all have busy lives. When my mother started showing signs of dementia, our lives changed. After a few years our big home was becoming too much for them to handle and posed a danger for Mom. Dad looked to me for advice and we were able to help each other out. Around this time Bayley had broken ground on the new village. My parents were interested, so when the time came, we sold the house and moved them to a lovely three-bedroom in the village, with a view of the lake and a wonderful screened porch. The house was great! Everything was on one level; there were no steps to navigate and it meant safety for Mom. Dad was able to care for her at home. Bayley made the transition very smooth. Everything was convenient. Their doctor was on the campus and they ended up knowing a few people who already lived there. 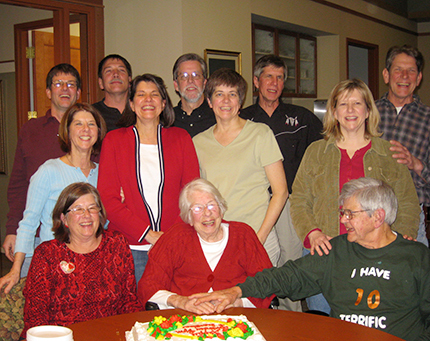 (Front center and right) The Wanninger’s and their large family created many memories together at Bayley. When Mom needed constant supervision, Dad started taking her to the adult day program three days a week so he could have a break. We were all so worried about her being separated from Dad – but she loved it! She was very active there and they kept her busy. As her disease progressed, it became evident that Mom was becoming too much to care for at their home. Bayley had a bed ready if needed in full-time care. We were concerned with how we could help Dad make this difficult decision. The Bayley family was here for us. They welcomed both my mom into their full-time care and my dad as he sat with her. Everyone got to know them and treated them with respect and dignity. And we talked Dad into going back to the Wellness Center pool a few days a week. There he formed a circle of friends and they became support to each other. Anything they needed, Bayley was there for them. Bayley always had and still does have our back. When my mother passed away five years ago, we all figured my dad would soon follow. No, wait, he still has living to do. There was so much around him that he couldn’t stop. He signed up as a volunteer and helped take people to Mass every day. We continued to visit him often at his house. He kept up his time at the wellness center and with his circle of friends. 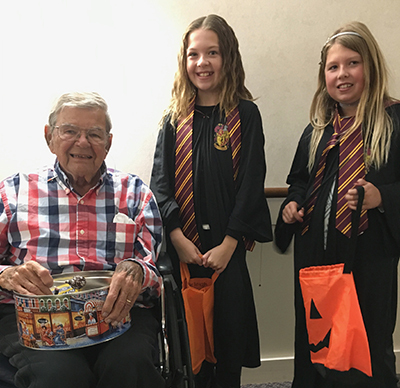 Bayley has become a second home to the Wanninger family, who enjoys visiting on a regular basis. Following a recent hospital stay this past July, Dad moved from assisted living to full care. He is in a wheelchair so it is great to have everything close at hand. At times he has utilized the physical therapy department for different aches and pains. On occasion, we still visit his friends at the wellness center. This place is truly amazing! Last June we celebrated Dad’s 96th birthday. Bayley has been a true blessing to my family. Not only have they cared for my parents over the course of the last 13 years, they have made our busy lives much easier. We are able to be with Dad and not have to worry about him. He has caregivers at Bayley who know him and treat him with dignity each and every day. Every single employee cares for his well-being and safety. Bayley exemplifies the mission of the Sisters of Charity; where staff carries out the Gospel values of respect, honesty and excellence by building loving relationships and caring for God’s children.